Emily Branch Designs | Branch Out. : Fancy little Magnets are a delighful little gift!! Fancy little Magnets are a delighful little gift!! So, deciding on gifts to make can be a little difficult, especially since you never want to repeat a creation. However, when you finally decide on a little handmade creation that you love to make, it's so fantabulous. So, for Mother's Day, in addition to handmade cards, I designed magnets using the Guidelines Stamps set from Papertry Ink. They look difficult to make, but are very easy and quick to create. 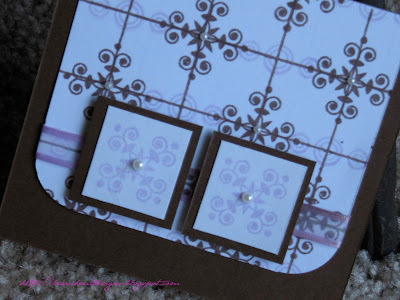 The set comes with a guideline grid stamp, and 1"x 1" motif designs that you can arrange in any way you want on the grid! I am addicted, and being the perfectionist that I am, these are the perfect stamps for me!! Clear Stamp: (Grid, Motifs from Guidelines set, sentiments from Mixed Messages set) Papertrey Ink. Ink: (Rich Cocoa, Angel Pink) Tsukineko. Cardstock: (Kraft) Papertrey Ink. (Pink) Bazzill Basics. (Brown) Michaels stores. Clear Stamp: (Grid, Motifs from Guidelines set) Papertrey Ink. Ink: (Rich Cocoa, Lulu Lavender) Tsukineko. Cardstock: (White, Brown) Michaels stores. Fibers: (Lavender sheer ribbon) Offray.